MONTREAL -- NHL goal-scoring leader Alex Ovechkin of the Washington Capitals will face the League's save percentage leader, Boston Bruins goaltender Tim Thomas, in one of the many compelling penalty-shot matchups determined today for Saturday's Gatorade NHL Elimination Shootout at Montreal's Bell Centre. The exciting finale to the six-event 2009 Honda/NHL SuperSkills® (7 p.m. ET, RDS, CBC, VERSUS, NHL Radio), the Gatorade NHL Elimination Shootout features four NHL All-Star goaltenders -- Thomas, Minnesota's Niklas Backstrom, New York Rangers' Henrik Lundqvist and Anaheim's J.S. Giguere -- facing penalty-shot attempts from nine All-Star shooters each in the time-honored game of hockey survivor. Only the shooters who score will advance. The competition will continue until a round is completed in which only one shooter scores. During a random draw conducted today in Montreal, each goalie selected nine players to face from among the 36 All-Star Game skaters. Following the draw, the goaltenders were permitted to 'trade' their player assignments and two transactions were completed: Thomas will face Alex Kovalev of Montreal in return for Backstrom facing Ilya Kovalchuk of Atlanta and Lundqvist will face Stephane Robidas of Dallas in exchange for Giguere facing Martin St. Louis of Tampa Bay. Who has the edge in the Elimination Shootout? The event will open with Backstrom facing all nine of his shooters at one end of the Bell Centre ice; Lundqvist, Giguere and Thomas will follow, at alternating ends of the ice. Jonathan Toews (Chi. ), Zach Parise (N.J.), Shea Weber (Nsh. ), Scott Niedermayer (Ana. ), Sheldon Souray (Edm. ), Marc Savard (Bos. ), Patrick Marleau (S.J. ), Dany Heatley (Ott. ), Ilya Kovalchuk (Atl.). Shane Doan (Phx. ), Dustin Brown (L.A.), Stephane Robidas (Dal. ), Andrei Markov (Mtl. ), Zdeno Chara (Bos. ), Keith Tkachuk (StL), Jeff Carter (Phi. 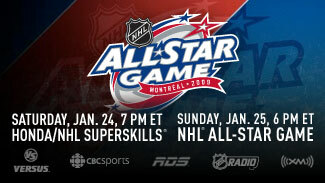 ), Rick Nash (CBJ), Vincent Lecavalier (T.B.). Thomas Vanek (Buf. ), Milan Hejduk (Col.), Tomas Kaberle (Tor. ), Dan Boyle (S.J. ), Mike Komisarek (Mtl. ), Joe Thornton (S.J. ), Jarome Iginla (Cgy. ), Martin St. Louis (T.B. ), Patrick Kane (Chi.). Eric Staal (Car. ), Mark Streit (NYI), Brian Campbell (Chi. ), Jay Bouwmeester (Fla.), Mike Modano (Dal. ), Ryan Getzlaf (Ana. ), Evgeni Malkin (Pit. ), Alex Ovechkin (Wsh. ), Alex Kovalev (Mtl. ).